A quick Google search on the word ‘riviera’ defines it as ‘a coastal region with a subtropical climate and vegetation’, with images showing sunny beach landscapes and picture-perfect summer vibes. 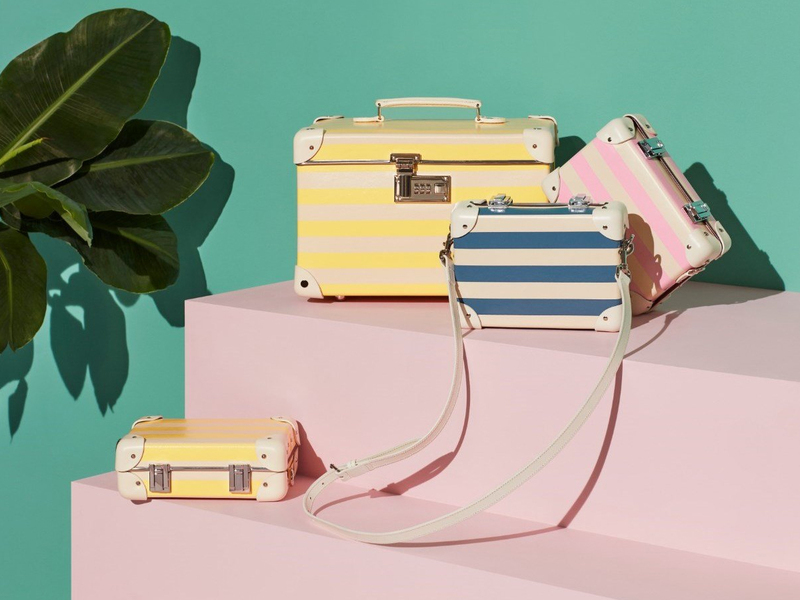 Which is also what the UK-based luggage brand Globe-Trotter was gunning for in its all-new selection of bags which come in 3 different riviera-inspired colour schemes for Spring-Summer 2019. With names like Citrus Yellow, Ocean Blue and Pink Lemonade, all of which contrasted with ivory stripes (like the beach chairs, towels and umbrellas found on any riviera-worthy beach), the colours are truly all love. The specially screen-printed stripe motifs can be found on several designs, ranging from the brand’s signature Trolley Case in 20” or 26” to the smaller-sized pieces which will be shared in detail below. The all-new Miniature Case (GBP696 or SGD1234 after conversion) is one that comes with the makings of the brand’s traditional suitcase, but shrunk down to a compact size that measures just 21 cm by 15.2 cm. Rendered in a sturdy vulcanised fibreboard body, the case (or rather, bag) comes with double polished chrome clasps, and is armed with a detachable adjustable shoulder strap so you can sling it easily over the shoulder or across the body. Then, there’s the equally gorgeous 13” Vanity Case (GBP804 or SGD1426 after conversion) which comes in a handy size that you can take along with you most anywhere. Measuring 32 cm wide and 24 cm high, it comes with a depth of 21 cm and even fitted with an extra tray to keep all your jewellery or makeup essentials neatly organised, sealed within a 3-digit combination lock that ensures maximum security. Availability is down to just 1 or 2 pieces as they were only produced in limited quantities, but here’s the good news. Globe-Trotter offers complimentary shipping to Singapore, with the prices above exclusive of VAT (though you will have to factor in GST when it reaches your doorstep), and should reach you within 3-5 working days. Looking for the perfect summer friendly piece? These could be it.